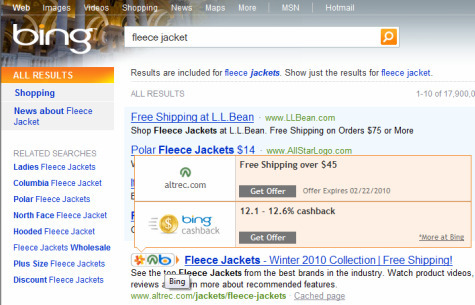 Since Bing hit the search-engine scene, it has been trying to convert users from Google and Yahoo, in part by offering Bing Cashback on many purchases. Bing has garnered 10% of the search market share, but many users are still hesitant to switch from Google or Yahoo. Now, thanks to a new feature from Billeo that puts Bing Cashback offers directly in Google and Yahoo Search results, users can enjoy the savings of Bing Cashback without quitting Google cold turkey. 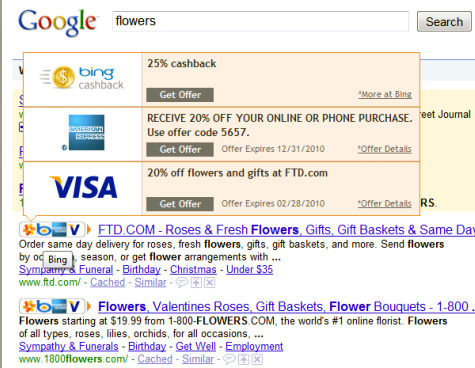 The new version even puts Bing Cashback offers in Bing search results that are otherwise missing them! By clicking on a Bing Cashback offer with the Billeo Offer Assistant, you will be shown the Cashback amount and prompted to enter your email, as if you had arrived from the Bing site itself. In fact, if you want to, you can click on "more info" on any Bing offer and you will be taken to the Bing Shopping page for your search term. With the addition of Bing offers to the Billeo Offer Assistant, the company has increased the number of merchant offers from 350 when we looked at the savings tool in September to approximately 1,500 merchants. 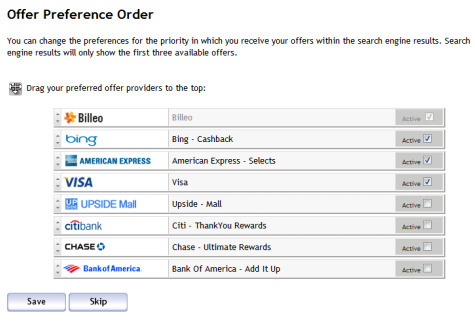 With more offers and more rewards programs, Billeo has also added the ability for users to choose which loyalty programs are important to them using the built in "Loyalty Preferences" menu. "The typical house is part of 14 loyalty programs, but only active in 6," Murali Subbarao, the CEO of Billeo, said in a phone interview; explaining that the new feature allows consumers to, "choose programs they care about." In addition to showing you the offers from Bing, the Billeo Offer Assistant shows credit card rewards and other loyalty programs to help you save at retailers big and small, including popular stores like Best Buy, Barnes & Noble, Textbooks.com and JCPenney. The Billeo Offer Assistant is a free savings tool that works with Firefox and Internet Explorer on Windows computers running XP, Vista or Windows 7 and with Firefox on Intel Macs. Billeo is also looking into providing a Chrome version of the tool at some point in the future.